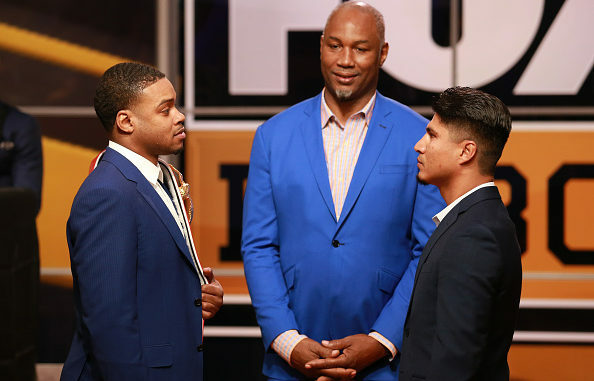 Errol Spence, Jr., Lennox Lewis, and Mikey Garcia attend the FOX Sports and Premier Boxing Champions press conference on November 13, 2018 in Los Angeles (Photo by Leon Bennett/Getty Images). For months, lightweight titlist Mikey Garcia responded the same way to questions of his future, and for months aficionados met his response with crinkled brows, upturned noses, rolling eyes. Was Garcia’s absurd answer tactical? A matter of bait and switch? Of shifting focus from who he was not fighting—the little wizard of Ukraine, the unfriendliest “Bud” in Omaha—to a challenge that would charm his devotees? Because if Garcia wanted to fight THAT GUY, so the logic might go, surely it was not his fault that a lesser opponent was put in his path. His intentions were clear, after all. But then he needn’t really overcompensate given the opponents he’d faced since ending a short retirement. Maybe he was embracing the ambitions of a fighting family, one that recognized the finest fighter in their progeny and foisted on him their unfulfilled dreams. Maybe he was speeding those same ambitions to their ruin in an act of subtle self-sabotage with which to leave—this time, permanently—a profession that never fully meshed with his constitution. Perhaps, though this seems too romantic, too literary, out of keeping with the wiring of a 39-0 fighter who’d won titles in three divisions. Whatever his motivation, Garcia had spoken in earnest. On March 16, he faces welterweight Errol “The Truth” Spence at AT&T Stadium in Arlington, Texas. There is hardly need to reiterate the threat Spence represents. Suffice it to say he has broken men much larger than Garcia and is expected by many to one day own outright a division long promised to him. As such, Spence gains almost nothing in victory. Garcia is arguably the finest fighter Spence has faced, but beating such an opponent means little when he fits comfortably into a division two south of your own. And that is why Garcia, not Spence, is the story. Whether he is the best lightweight in the world is unclear, he has no claim to junior welterweight supremacy, yet he is facing one of the two best welterweights on the planet. Had he chosen Danny Garcia as an opponent, or Shawn Porter, or even Keith Thurman, the response to Garcia’s daring wouldn’t have been the same (because not one of them represents a seeming impossibility). That is how good Garcia is; that is how well he is esteemed. There is, then, a slight hedge in Garcia’s selecting Spence—because losing to the world’s most dangerous welterweight does less damage to his stature than it does his body. It is the danger and damage that Spence represents that offers Garcia his greatest reward. And yet, talk of Garcia pursuing greatness—and there has been a furious amount of it—is premature. Greatness is not guaranteed by matchmaking—taking a great risk does not a great fighter make, nor does it confirm aspirations to become one. In the ring, greatness comes by the pound, yes, but also in blood, and it is fair to question whether Garcia cares to or will be allowed to bleed enough. Spence will hurt Garcia in new ways, to new degrees, and that hurt will be compounded both by the pressure Spence applies and the meager effect of Garcia’s typical mastery. How Garcia responds to the penalty of his daring is unclear, and how his trainer and brother Robert responds to witnessing that penalty is a similar mystery. The temptation of glory could override considerations of the future. But could those same considerations have already furnished the brothers with the criteria for a furtive glance and expedient towel? It is naive to not wonder such things. If there is not quite an ominousness about this fight, there is at least a frustration with it as an obstruction, an absurdity delaying better fights in a sport rarely in a hurry to what is better. This is especially the case for Spence, who has long expressed ambitions greater than the razing of a lightweight. No one asked for Spence-Garcia until Garcia did. What might that mean? Garcia knows too what happened to Brook and Khan, how they were taxed for their daring, how suddenly that tax was levied. He is, then, in the face of doubt and derision, actively courting his first professional defeat, by stoppage no less, in a fight that could curtail his prime. Garcia can fight anyone he chooses, and he has chosen Spence. That does not justify the fight or make its outcome seem any less inevitable, but it marks Garcia as a fighter whose deeds match his words when he speaks ambitiously. And that consonance sets him apart. Jimmy Tobin is a member of the Boxing Writers Association of America. His work has appeared in The Cruelest Sport, 15 Rounds, Undisputed Champion Network, Esquina Boxeo, El Malpensante, The Queensbury Rules, and The Fight Network. He teaches at George Brown College in Toronto.